Yes, there’s a Trump bump in the equity markets. But the market’s a fickle friend, Mr. President, and it doesn’t help your working-class supporters. Still, the President has a case for a bona fide Trump bump in the stock market. 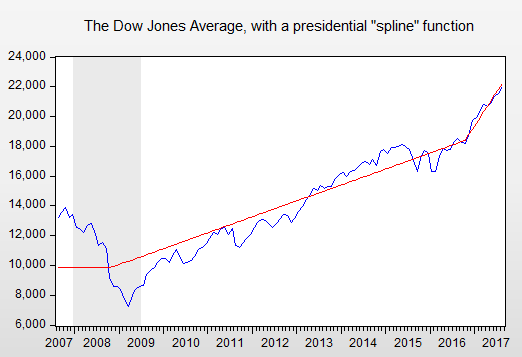 The figure below plots a “spline function” through the DJIA since late 2007. This function is constructed to produce a linear trend with specified kink points. If the kink points are insignificant, the trend’s slope won’t change (apologies if I’m “mansplining”). The kinks are the terms (starting with the month they won) of Presidents Obama and Trump, and the acceleration starting in November 2016 is clear. For the record, Obama had a long, bull run himself. I always said that guy was a lousy socialist, albeit a great president. Also for the record, it has long been known that the economy grows faster under Democratic presidents. Moreover, if I were Trump, I’d be awfully cautious about tying myself to the masthead of the DOW. It goes up, it goes down, and while the correlation of that kink point and his election is undeniable, over the longer-term, presidents don’t have nearly as much influence on markets as they like to think (when it goes up, of course). Just look at where the dollar is now: its Trump bump has already fizzled. In this regard, though he gets a high-grade so far, I thought Treasury Secretary Mnuchin made a rookie mistake when he agreed on CNBC that the stock market would be the Trump administration’s report card. –Research by NYU economics professor and wealth expert Ed Wolff finds that fewer than half of all households (46 percent) own stocks, either directly or indirectly (like through their retirement account). However, among the richest 1 percent of households, the ownership rate is 94 percent. –The value of holdings is even more skewed than straight up ownership. Among the half of households with some equity holdings, less than a third hold at least $10,000 in stocks, compared to 93 percent of those households in the top 1 percent. –Since the late 1980s, about 80 percent of the value of the market has been held by the top 10 percent, and about 40 percent of the market’s value belongs to the top 1 percent. –In other words, the share of stock market wealth held by the top 1 percent (38 percent), is twice that of the share held by the bottom 90 percent (19 percent). I know I’m not the Jared to which Trump listens. If I were, I’d warn him that the stock market is as fickle a friend as they come, and not much of a friend at all to those in his core constituency. Share the post "Yes, there’s a Trump bump in the equity markets. But the market’s a fickle friend, Mr. President, and it doesn’t help your working-class supporters." 2 comments in reply to "Yes, there’s a Trump bump in the equity markets. But the market’s a fickle friend, Mr. President, and it doesn’t help your working-class supporters." I do not agree. There is no Trump bump. If Clinton was heading toward a victory in late October, markets would have been hitting new highs almost everyday during that part of the cycle. The indecision of polling lead toward investors holding back trades. Period. Rising markets are about rising debt that=rising jobs. So yes, it helps “his supporters”. You don’t pay attention to the cycle, you miss the event. Sloppy, future revised government data nevertheless. If the market were rising in anticipation of stronger future earnings growth it would show up as a higher P/E. But the P/E has not risen. The S&P 500 P/E on trailing operating earnings per share traded just over 21 prior to the election and just under 21 since the election.